Oil paints can be applied using various techniques and methods, and oils artists tend to favour a selection of brushes that suit their favourite painting techniques. If you're just a beginner it may be difficult to choose between the array of brush shapes and sizes on offer. Over time you will come to find that you prefer using particular brushes, but to begin with it is best to try as many brush variations as you can. Don't be afraid to experiment and you'll soon settle upon your perfect brush collection! Getting yourself a good set of quality brushes is a fantastic investment. The better quality brushes you can buy, the more steamlined your painting technique will become and creating artwork will be a breeze! For oils artists, it is of the highest importance that their brushes are strong and durable. Working with and cleaning up your oil paints will involve the use of harsh solvents, so your brushes must be able to stand up to repeated exposure to these chemicals. The surfaces you choose to paint on can also deteriorate your brushes over time; repeated application to rough or dense canvas can considerably shorten the workable life of a lesser quality brush. With so many brushes on the market, how do you choose the right ones? Over time, after experimentation with brushes of different shapes and sizes, your favourite brush selection will soon become apparent. But if you're just beginning, how can you narrow down your selection? Do you choose synthetic or natural hair? Brushes with a short handle or a long handle? And which shapes will make the most of your painting techniques? With so many considerations to be made, choosing a brush can seem a little overwhelming! The information below will help you understand the basic differences between oil brushes and help you settle on some good brushes to start your oil painting journey. The brush shapes that you choose will depend entirely on the techniques and effects you wish to create. There are a handful of commonly used brush shapes that will cover most painting techniques, but some more specialised brush shapes can be useful for special effects. A round profile brush is made up of a cylinder of hairs that taper to a point or form a slightly rounded tip. They are perhaps the most popular shape and are suitable for a range of techniques. Flat brushes are made from hair arranged with sharp square-edges. These edges are brilliant for creating hard edges or for making bold, geometric strokes. Commonly available as a long flat or a short flat (bright). A Filbert brush features hairs that are arranged in a flat, rounded formation. Their oval shaped profile provides a rounded mark that can be used to blend or even create flower petals. Rigger brushes have much longer hair than any other type of brush, that tapers to a very fine point. They are ideal for fine detail techniques in oils or acrylics, but require careful cleaning after use. Fan brushes are made from hair that is made into a canopy-like shape. Ideal or a variety of special effects, fan brushes can also be used for blending, softening edges or adding texture to your work. Larger flat brushes are commonly used to 'block-in' large areas of colour, add a glaze or to apply a final varnish to your work. Large and flat, they can hold large amounts of colour, making them ideal for this purpose. We also stock a range of unique oils brushes made in unusual shapes that are brilliant for certain textures and techniques. The Terry Harrison Masterstroke range and also some brushes from the Omega and Bob Ross ranges offer unique brush tip shapes that are great for creating anything from branches and leaves to textures and petals. Oil painting brushes need to be made from fibres durable enough to withstand repeated exposure to harsh chemicals and solvents, whether they are synthetic or natural fibres. Over the years there have been great leaps in the manufacturing of synthetics that has resulted in man-made fibres that are able to mimic the properties of their natural counterparts. Artists that wish to avoid using animal-derived products in their art now have more choice than ever when it comes to selecting a new brush. Of course there are benefits to using both. The natural fibres of your favourite Oil and Acrylic brushes will be made from tough and resilient hair. They are tailor made to resist the corrosive chemicals commonly used to clean them, and are also able to withstand the abrasive process of being used on coarse canvas or board. The most common natural hair used in oil and acrylic brushes is hog. Strong and springy, this hair retains brush strokes which can add texture to your paintings. Hog hair has natural split ends which makes them strong enough to stand up to use with thick oil paints, canvas and harsh solvents. 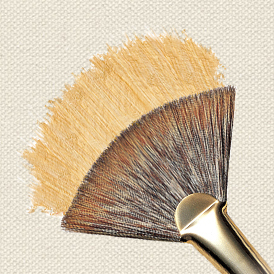 Large flat hog brushes are ideal for creating bold marks that retain brush stroke and texture. 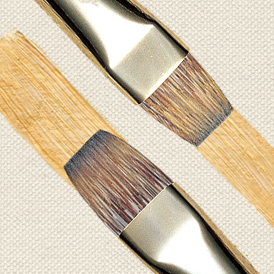 Sable brushes suitable for oils, such as the Georgian Sable brushes, are more suitable for fine detail techniques. Sables designed for use with oils are much softer and more delicate than a hog bristle or synthetic brush, so consequently they require extra care during use and when cleaning. They are creat for adding in fine details, blending, glazing and creating soft, smooth marks. You may also come across other varieties of natural hairs when you are looking at oil brushes. Some notable examples are ox, pony, badger and sometimes mongoose (although these are now an endangered species, so finding this type of brush will be rare). Developments in synthetic research means there are now synthetic alternatives to your favourite brushes, including hog. Softer synthetics, such as the Mongoose-alternative in the Monarch range are available and can be used to achieve fine detail. We stock a wide range of synthetic brushes that are suitable for most oil painting techniques. Monarch is a professional synthetic hair brush that mimics the look and feel of natural Mongoose hair which is no longer used in the manufacture of brushes as it is an endangered species. Just like Mongoose hair, the polyester filaments in Monarch provide a stiffer alternative to sable hair but are softer than hog bristle which means this brush is excellent for subtle blending, glazing and fine detail work. In addition, because Monarch is synthetic it is more durable than natural hair and has more spring making it better for moving heavy bodied oil colour as well as being less prone to damage from solvents or paint. 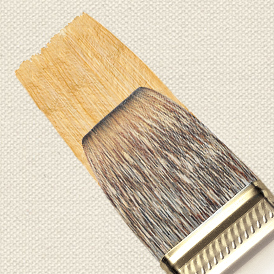 A traditional Hog bristle brush is not the ideal match for Water Mixable Oils. When soaked in water a hog brush will gradually loose its shape and spring, causing it to become weak. This weakness in the brush will make it considerably harder to control your oil paints on your canvas or board. Regular synthetic brushes are also not ideally suited to Water Mixable Oils. The majority of synthetic brushes have been manufactured to work seamlessly with watercolours and acrylic paints, which means that their fibres are more often than not too soft and flexible to be used with a thick, full-bodied oil colour, especially if it is used straight from the tube. Special brushes have been developed with this consideration in mind - their durable, synthetic filaments are stiff enough to cope with even the thickest oil applications. Another decision you will have to make when choosing your first brushes is to decide whether you want to paint with a short handled or a long handled brush. Both have their benefits, but use either of them in the wrong context and they can be difficult to paint with. You can find out a bit more about both brush varieties below. 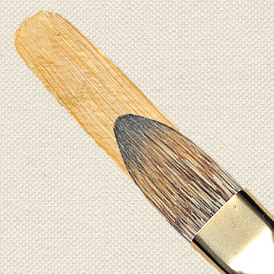 Long handled brushes are commonly used to create broad, gestural strokes. 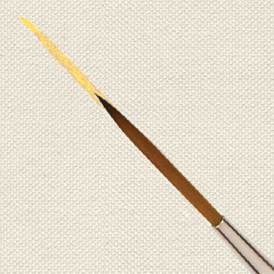 The length of the handle allows the brush to be held at a distance away from the painting surface, and artists that work on larger canvases with a loose technique often opt for this type of brush. The distance between your hand and the painting surface means that even the smallest of movements of the brush can create broad strokes of colour. This is particularly beneficial to any artists who have an expressive style as it is much easier to loosen up your painting technique than it is with a smaller, short handled brush. 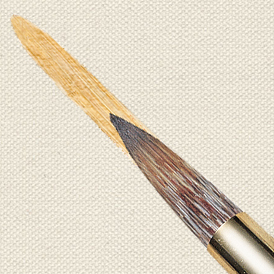 Short handled brushes are ideal if you are looking to work close to your painting surface to create fine detail. Artists who like to paint in close proximity to their painting surface will almost definitely find long handled brushes very difficult to work with. The extended length of the brush will get in the way the closer you get to your canvas. These types of brushes are ideal for efficiently crafting the fine details and precise strokes. Wipe excess colour from brushes with a rag. (Dispose of rags safely). Wash with warm water and household soap, repeating until there is no trace of colour. Shape brush, dry handle and lay flat to dry.